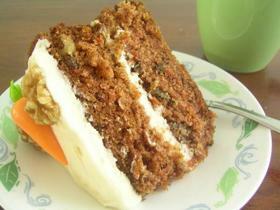 Carrot cake is one of my favorite cakes. This one is my favorite recipe! I like crasins or chocolate chips in exchange for the raisins sometimes. 1. Preheat oven to 325°F. Prepare two 9” pans or one 12” cake pan or one 9”x 13” sheet pan by lining with parchment or wax paper. 2. Mix together in a bowl together flour,baking soda, baking powder, salt, cinnamon and nutmeg. 3. In a bigger bowl, whisk together eggs, oil, sugars, and vanilla for about minute or so. 4. Add the dry ingredients to the wet mixture and mix for about 2 minutes more. 5. Add the grated carrots. Then add nuts and raisins if desired. 6. Pour batter in prepared cake pans and bake for approx. 45 to 50 minutes. Test for doneness by inserting a skewer, it should be dry when taken out. Cool then fill and frost with cream cheese frosting. Garnish with more nuts. 7. To make the cream cheese frosting: a bowl beat together cream cheese and butter until creamy. Add in icing sugar and beat for a minute. Add vanilla. Scrape down the sides of the bowl and beat for another minute.